I started collecting vintage items about 20 years ago. My mom has always loved antiques, auctions, garage sales and thrift shops. We sold collectibles together on Ebay for a few years in the 1990's, and were quite successful. My mom continued to sell at consignment shops to supplement her retirement income (and for fun). She still dabbles in selling, even though downsizing to an apartment slowed down her buying and selling. When I first started collecting, I read the collecting guides that really stressed condition, condition, condition of the item. So chipped, cracked, worn items seldom came home with me. 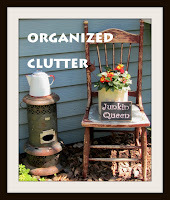 Over the years my tastes have changed some, and I have my pretty collections and my rustic, junky collections. So, what do I collect? You will see my collections all over my house and gardens. I could never be a minimalist, but I like my collections and clutter to be ORGANIZED! 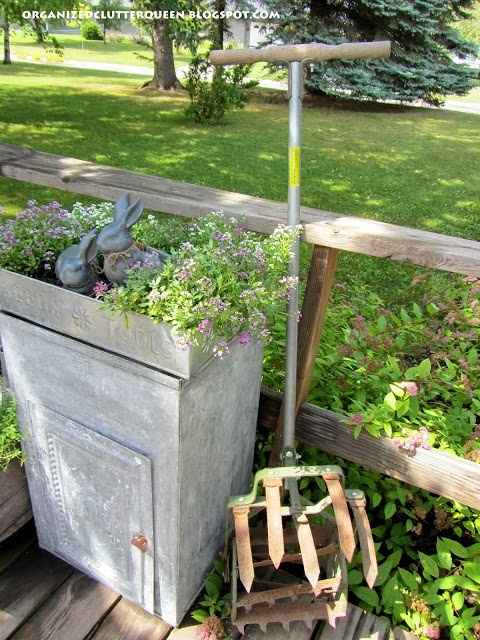 You can just never have too many galvanized buckets. Old mop buckets are tops in the bucket world! Buckets work for all seasons. Minnow buckets and inserts ROCK! I used pot lids, measuring cups, an ice cube tray, Jello molds, aluminum pots and butter knives for a kitchen fairy garden. Kitchen fairy garden 2012 had a muffin tin and a ricer. Indian corn in a berry sieve on the potting bench/sink. A toaster planted with hen and chicks, and a berry sieve with lantana and creeping Jenny. 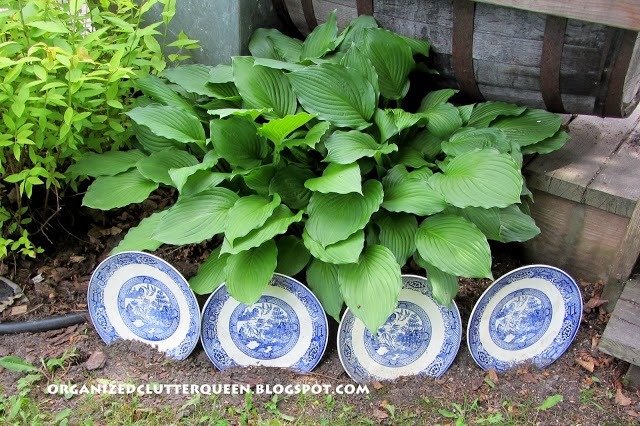 Frame a hosta with garage sale or thrift shop dinner plates. Plates in my potting sink! This is a no brainer! 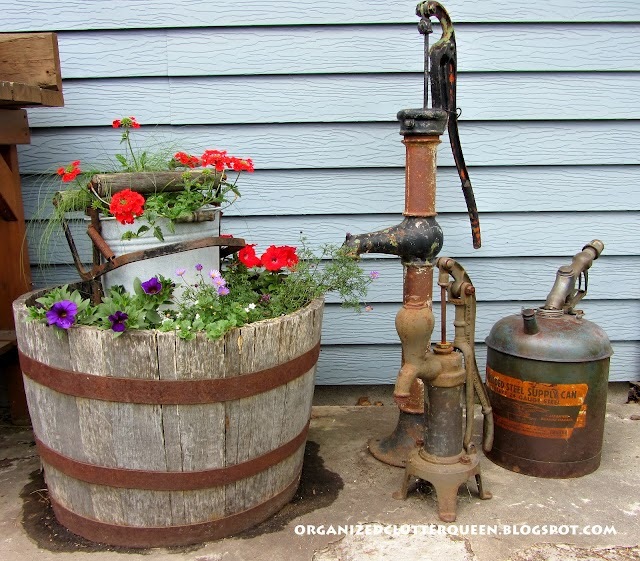 Watering cans are a must have outdoor collectible. 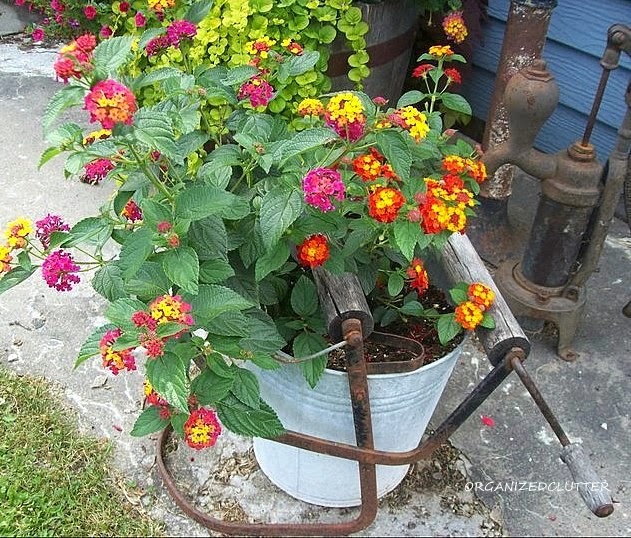 I love the old galvanized patina of vintage watering cans. 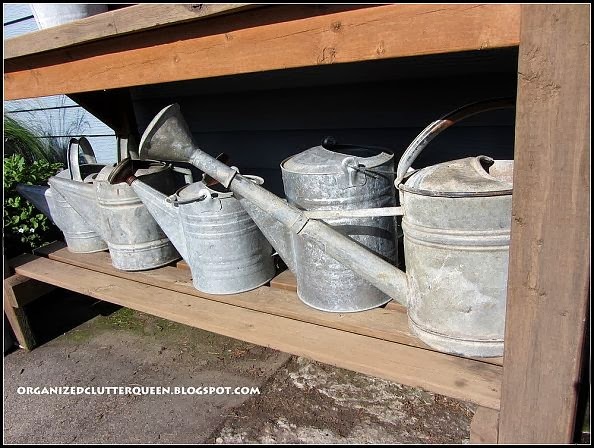 Pick up inexpensive vintage yard and farm tools to display in a grouping. Old sprinklers are a fun collectible. I love displaying vintage garden hand tools. This is an old Ro-Ho cultivator. 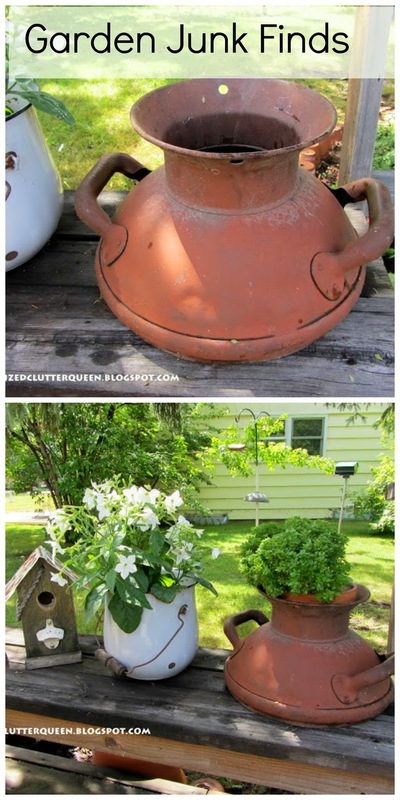 Some old farm implements will even hold a terra cotta pot. 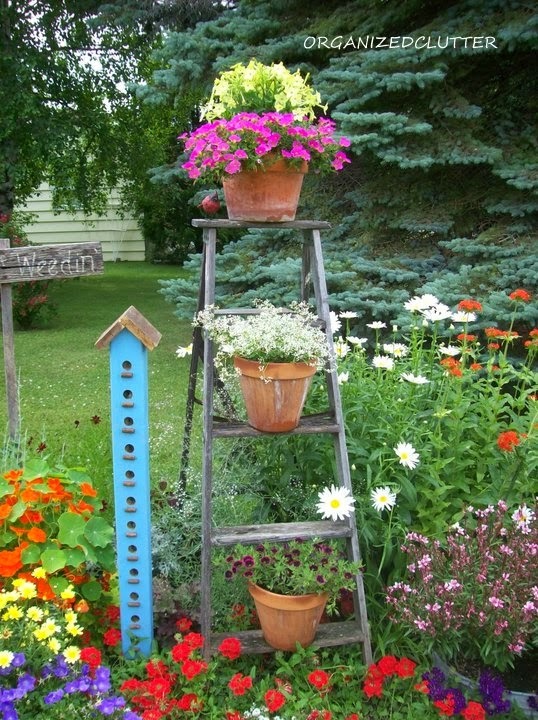 Stepladders work perfect with terra cotta pots. I put a large nail or spike through the rung from the bottom and anchor the pot by putting the pot hole over the nail. An old tree house ladder. Marbles and a dart board. Croquet and bocce balls on the patio. A rusty metal toy car and horseshoes. 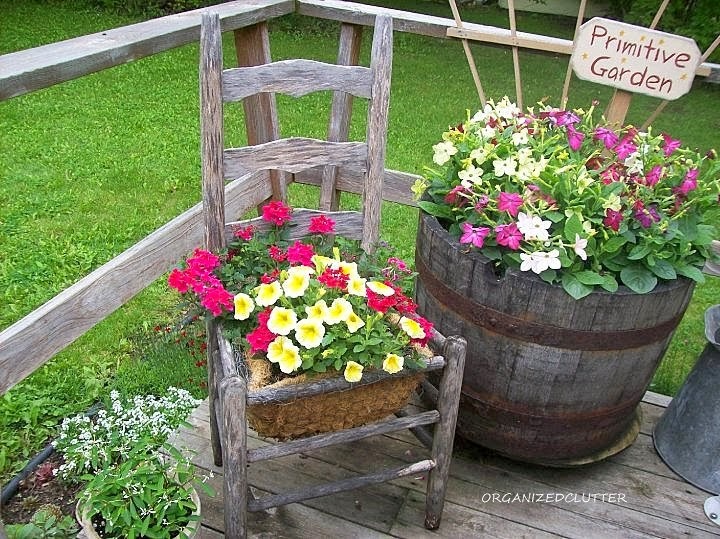 Old chairs with pots on the seat, or planted right in the seat with chicken wire and moss. 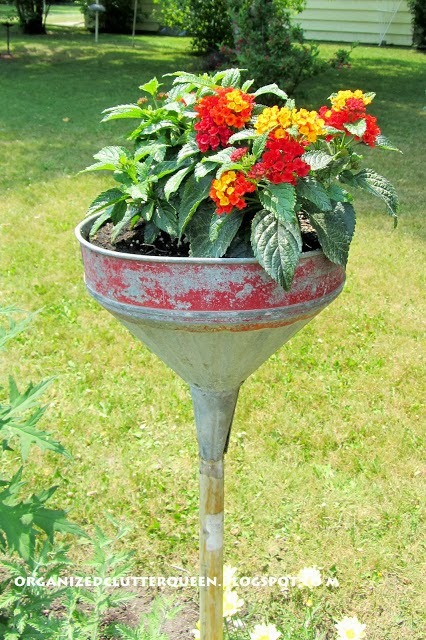 Funnel on a broom stick planter. Funnels in a flower pot. I love planting in old galvanized laundry tubs. An old ironing board, iron, and clothespin bag on the patio. 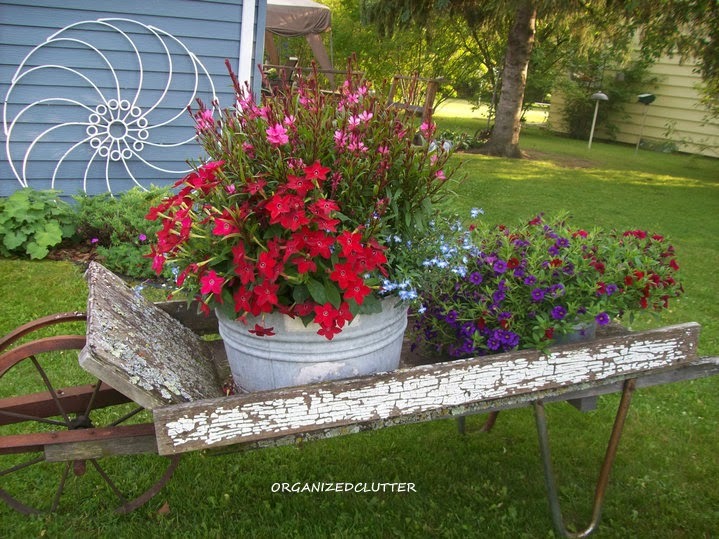 Laundry tubs in the wheelbarrow with a vintage wringer. Even a milk can top holds a terra cotta pot! 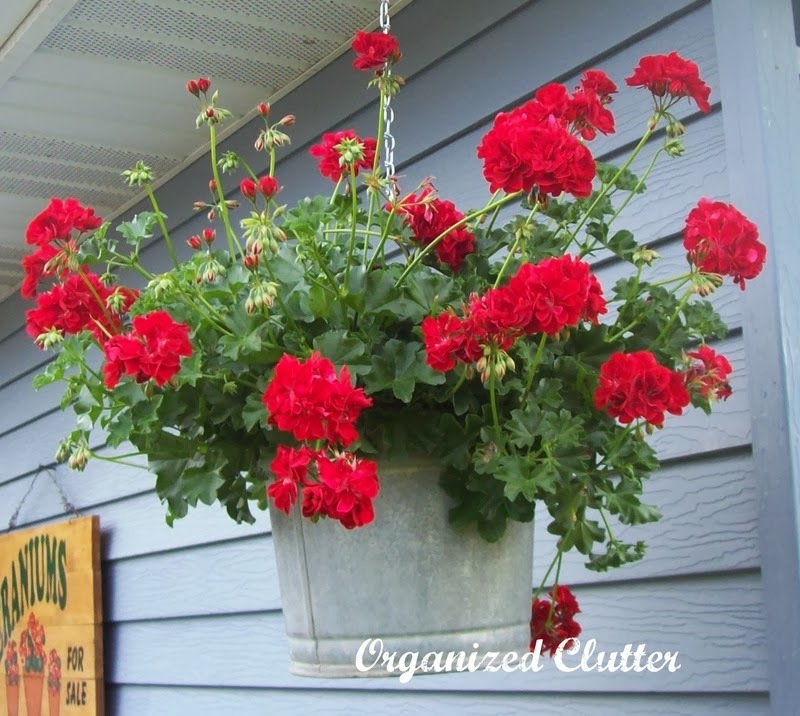 Did I inspire you to decorate your gardens and yards with collections? I hope so! It's fun! I love, love, love this post!!! Now I am on fire to find all sorts of containers for flowers....:) You are so creative and your flowers were beautiful! Thanks for sharing! Now I really miss summer!! Your gardens are gorgeous!!! You know I love it...I have a favor to ask. Is there a way you could do a video or farther away pictures. I would love to get a feel of the whole yard. 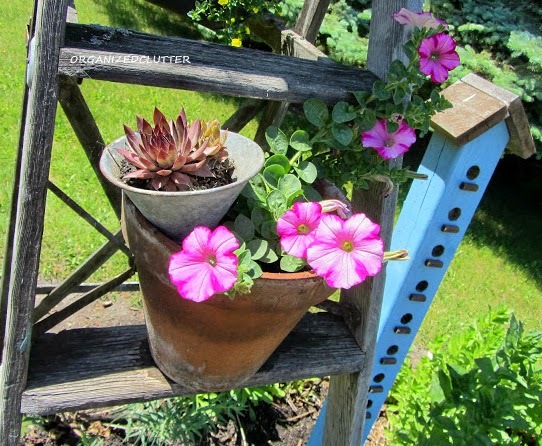 I just love your garden posts and they truly inspire me to do something wonderful in the yard even if a small thing. Thank you so much! LOVE YOUR JUNK!! I think I could live in your garden - amazing! 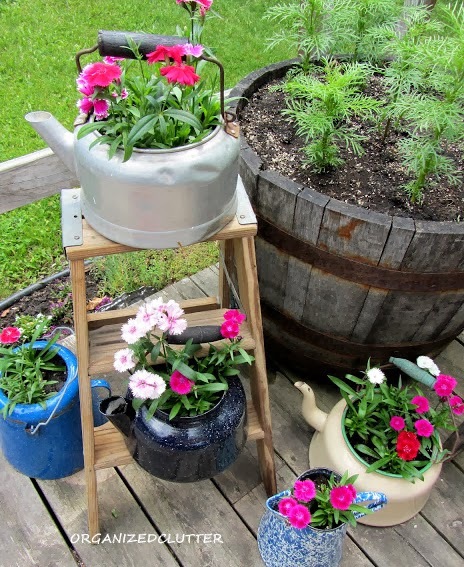 Love your post and you have so many beautiful items in your garden. Thanks so much for sharing with us. 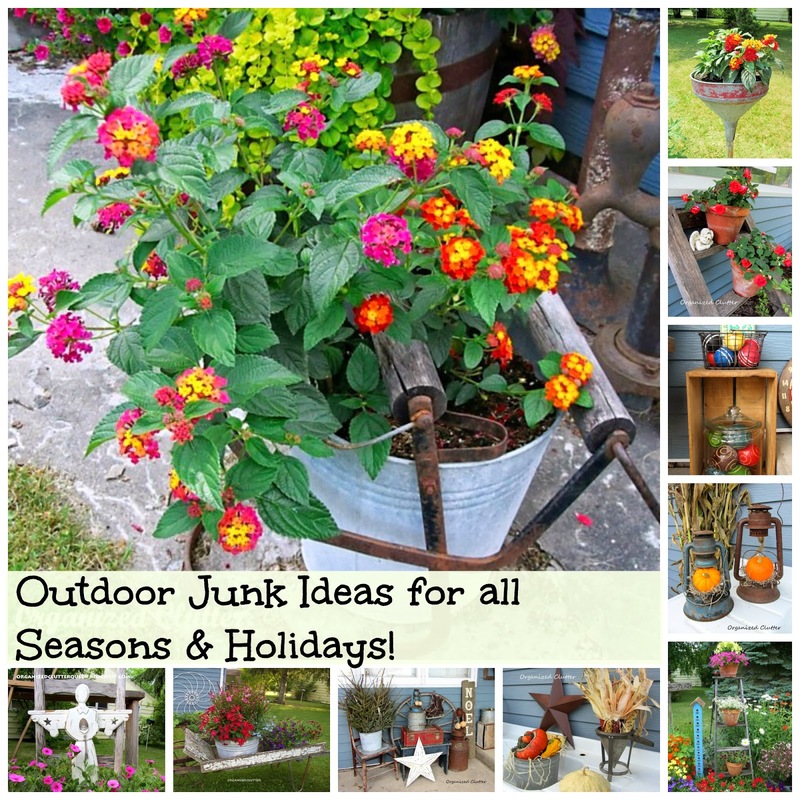 Oh yes...you inspired me to want to decorate my flower gardens and yard with collections!! 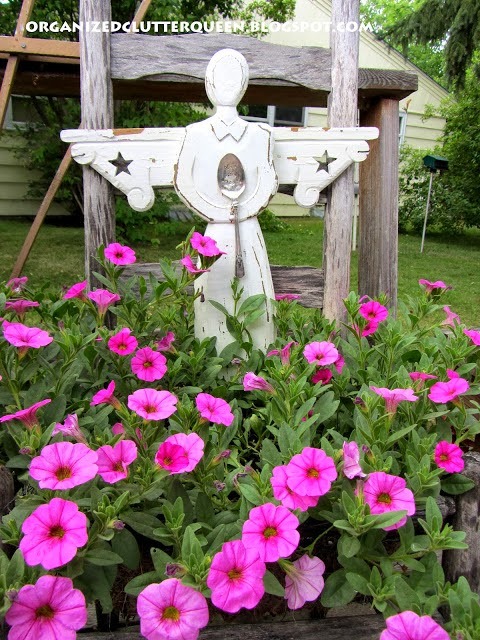 I used to have lots of things out in my front flower gardens, but I stopped after waking up one morning to find that someone had stolen stuff from my front yard. I so put a few things outback in the fenced in area. I so love seeing pictures of your pretty gardens. You need to write a book. Your pictures would tell the store. You could do a series.....one for inside and one for indoors, and the how tos. Great ideas for all of us. I never get tired of seeing your gardens and they certainly were inspiring here in the dead of winter! 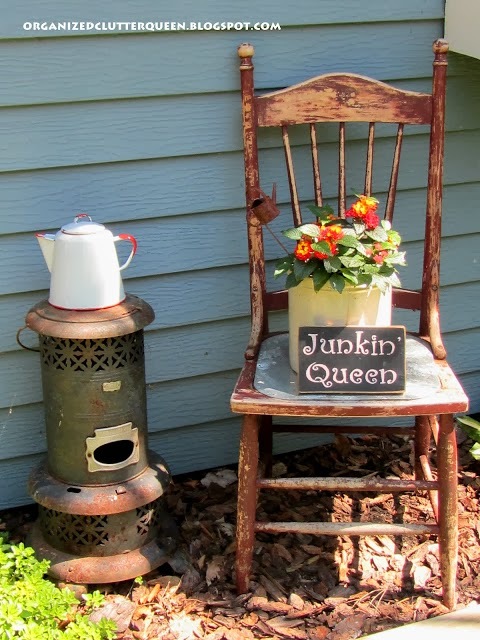 Love your beautiful photos and your beautiful junk! You're getting me excited for spring to get here. It is coming, right? Love all your antiques!! But you must spend ALOT of time watering all your plants!!! Your changing vignettes are so clever! Thanks for providing some ideas. 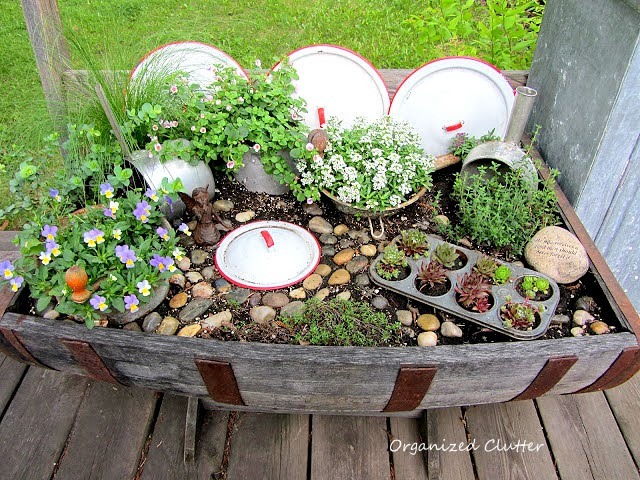 How do you find enough time to care for your beautiful garden on top of collecting, upcycling, and everything else you do?